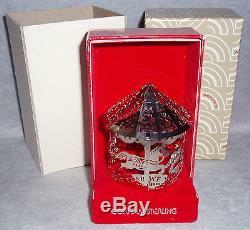 1979 Gorham Sterling Pierced Carousel Ornament. Very hard to find Gorham pierced, three dimensional #1558 Carousel ornament from 1979. This was designed by Robert McCutcheon, and features a covered carousel of horses in pierced, 3D sterling silver filigree. It is 3 inches tall by 1 7/8 inches wide. This appears to have been lightly used, and may exhibit a couple of very minor bends. It does not have the silver hanging loop. It is marked Gorham Sterling in the piercing on the bottom of one the panels. Comes complete with original fitted box and outer sleeve. As with all vintage silver, may require proper polishing upon receipt depending on your preferences. Nice, hard to find collector's edition ornament for the discriminating collector on your gift list. If by some small chance your item is not satisfactory, your return should still be received within 7 days or less. Be sure to check my other listings for many Christmas sterling pendant /medallion / ornament / charms, and other great gift items, Victoriana, Elegant Glassware, Vintage Clothes and Shoes etc. The item "MIB Gorham 1979 Sterling Silver Pierced Collection Carousel Christmas Ornament" is in sale since Wednesday, January 23, 2013.